How often does it snow for a race in late April? Not that much, right? Sure, there's that old Liege-Bastogne-Liege in 1980 that Hinault won in a blizzard... but this year that seems ancient history. In fact, watching the spring classics over the last few weeks take place under almost summer-like weather has been a tease for us stuck in a wet, raw New England April. Yesterday I saw the recon pics from Liege-Bastogne-Liege: Pros mostly riding in shorts and short sleeves while training - it must have been pretty darn warm, usually they're well wrapped up in training. The last days around here were 40's and 50's F, with flags straight out in a cold wind. Shoe covers, long gloves, thermal cap, the whole nine-yards. Windtunnel. Cold. Today our long awaited Flandria Cafe - BikeWorks - Flandria team kit came in. I spent part of the afternoon at the shop organizing kit bags for the boys. Giordana, our supplier, did a great job, the replica Flandria Kits look sweet. Classic design, for sure. Red matched the bikes perfectly too. This is the kit and bike of our masters (45+) team this season. A real seasoned bunch of American flahutes. 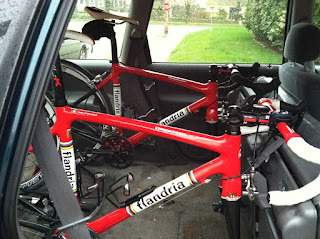 Here we see our big man Marc DeMeyer-stein testing out new kit and his just built up new sweet Flandria Competition rig. Marc went with Zipp wheels and new black SRAM red. Nice ride. No more excuses for bike nausea now Marc... the bergs await! Signing off...I'm now scrambling to get ready for the Quabbin Road Race early tomorrow AM. Here in my virtualcafe, I've often sounded off about how I like seeing a guy outside one of the big favorites snag a major classic out from under the nose of the highly paid favorites. Maybe it comes from never having the talent to ever be a favorite myself way-back-when. Or maybe it's that good 'ol American 'root-for-the-underdog' tendency. Whatever. I just know that I love unexpected exploits like the one Johan Van Summeren pulled off on the Carrefour de l'Arbre last Sunday. 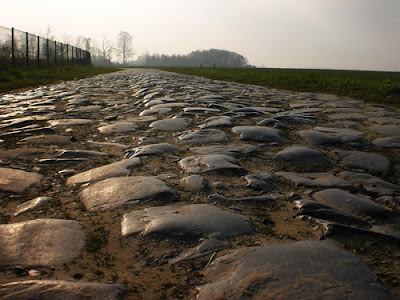 Johan wasn't the only unheralded rider to make a mark on this year's Paris Roubaix. Martin Tjallingi of Rabobank was also in the zone, always pushing the pace, opening up gaps on the pave seemingly at will, and in the end still having enough juice to earn a podium spot in a sprint. Martin who? That's who. Staf Scheirlinckx. Domestique no more. Sunday was also a day for an aging domestique. Phenomenal ride by the unheralded Staf Scheirlinckx. The Verandas Willems giant (he's 6' 4", 170) was in the big selection on the Muur, and rode to a fine 8th place, one place better than his old Lotto leader, Phil Gilbert. At 32, and with only one victory in 12 years as a domestique, Scheirlinckx was given the freedom by director Lucien Van Impe to prepare and ride for himself at this year's Ronde. When you're the end of your career, chances like that don't come often. An Staf? Well he seized the day as they say. And for a moment, when he was there in the top six after the Bosberg, and the wielersupporter world outside Flanders said 'who's that guy?' 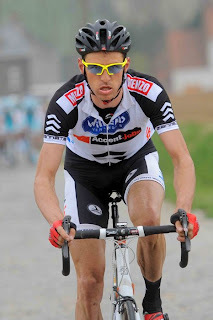 it looked like we might be in for another vlaamse schoolboy dream come true, on cycling's holiest day. "Nick Nuyens kan de Ronde van Vlaanderen winnen? Nick Nuyens kan de droom gemaakt? Nick Nuyens wint de Ronde van Vlaanderen! Nick Nuyens wint de Ronde van Vlaanderen!" In sports broadcasting, sometimes a simple event repeated to a crescendo by an excited voice makes a lasting impression on the public. Sometimes it births a line that resonates for generations. "The Giants win the Pennant!" Yesterday, from the streets of Meerbeke, the airways of the Flemish speaking world echoed to the jubilant words of the vlaamse Phil Liggett - Sporza's Michel Wuyts - who put the appropriate exclamation point on what was arguably the most exciting Tour of Flanders any of us can remember. "Nick Nuyens wint de Ronde van Vlaanderen!" Yea wielersupporters. Dreams can really come true, provided you never give up. It's Flahute's Christmas eve tonight. 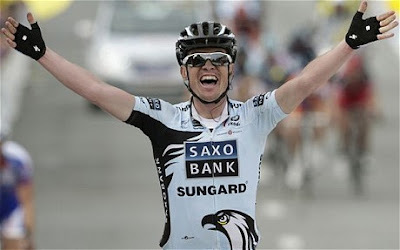 Tomorrow's the big one...De Ronde! Today? Well, it was exam time. I rode my first race of the season, the Fuji Chris Hinds Memorial 45+ masters criterium in Charlestown RI. A 0.8 mile course on an old Navy air base just a stone's throw from Charlestown beach. The airstrip was converted into a crit course that's a regular training race fixture in these parts. The only thing like the Ronde is the wind. There was plenty of that! No sitting in in this one. The Arc en Ciel team got the ever-strong Randy Rusk off early. Gear Works/Spinarts Tommy Stevens bridged up to him, and they stayed away.